Detailing clay makes auto surfaces smoother and cleaner than washing alone! Detail clay removes paint contamination like industrial fallout, brake dust, rail dust, tree sap, and tar while leaving the paint silky smooth. Read on to learn how to use a detailing clay bar to really clean your vehicle's paint. How do I know if I need to clay? Run your hand across the surface of your car, paying special attention to the front end and lower panels. 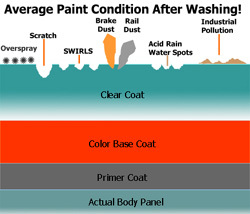 If you can detect rough areas, or gritty or bumpy spots, your car’s paint is contaminated and you need to clay. What does claying do for my car? Is it a necessity? 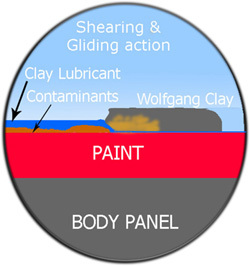 Claying is a process to decontaminate the paint, ultimately preparing it for polish and wax. This is an intense deep cleaning step that needs only to be performed once or twice a year. You see, ideally, when you apply a wax or paint sealant, you’re putting it on a pristine surface, completely free of bugs, tar, airborne pollution and brake dust. All of these have the irksome tendency to break the barrier that your wax or sealant provides, and work its way down to the clear coat or even into the paint. Left there, these contaminants will eventually allow oxidation to begin and cause tiny rust spots in the paint. To preserve a satiny-smooth finish, these need to be removed. The only way to do this without abrasion is with a clay bar. A perfect base for wax is a glass-smooth finish. How is clay different from polishing? Claying is probably the least commonly performed detailing step for the paint. It’s a bit more intense than polishing alone, but it’s also non-abrasive and easy to do. 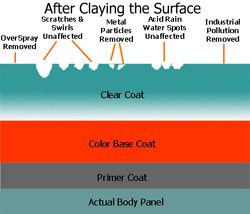 Claying actually pulls out foreign particles and contaminants that have embedded themselves in the paint, allowing the polish to do its job (filling in scratches and such). The job description for polish is more targeted at cleaning the paint, filling swirls and scratches, maximizing the shine by smoothing over sharp edges, robbing sun of its ability to reflect off them; Clay is for “optimal” surface preparation—to be followed by polish, (the filler and shiner), then sealing it all in for long-lasting protection. Do I need a clay lubricant? Clay bars absolutely need some kind of lubricant to work correctly. Without lubricant they will catch on contaminants, pull them across the surface, and probably mar your paint. They are formulated to work together! Clay lubes are designed to assist clay bars in gliding across the surface, grabbing at foreign particles lodged deep within the clear coat or paint as they go. The lubrication keeps these particles from raking roughly across the paint and causing further damage. Some folks say that you don’t need a “lubricant,” a simple car wash is enough. Car wash may work, but it will lead to the deterioration of the clay bar and shorten its life span considerably, as well as the absence of protection for your paint. Specially formulated clay lubricants offer increased protection through an ultra-fine, slick protective layer that coats your paint from harm.